Musicians Cherie de Boer and Jean-Pierre Guiran discovered a number of years ago that silence plays a prominent role in music. This apparent paradox  music and silence  became the catalyst for their musical renaissance. Using silence as well as sound to arrange their music, they were able to bring passion to even the simplest of pieces and give rhythmic melodies that extra sparkle. It was apparently such a success that they have now been together for seventeen years, physically, spiritually and musically. Jean-Pierre Guiran's French background is undoubtedly an advantage in performing the French repertoire. The character he radiates is authentic. "While I was a physics student I picked up a Hohner accordion for the first time. My life took an immediate U-turn. The feeling for music which manifested itself at that point, having lain dormant for so long, moved me to immerse myself completely in this music and instrument. I'm a natural accordionist - I squeeze for a living!" "It is Cherie's authenticity and the way she utilises dynamics in melodies that appeals to me." Where do you hear our music? In the US documentary short film "Picasso and Braque go to the movies" music of Accordeon Melancolique will be used. Go see it! Cubists LLC, D.P. Petr Hlinomaz  HD Documentary. Music of our CDs is used in the Dutch TV-film: Drilling in the sea bottom. The composition Helena has been used in a Peugeot sunroof TV commercial . Music of the CD Parade of the Poules has been used for the Dutch Ikon TV documentary oud en der dagen zat. Ordered by Danshuis Limburg Merkx & dancers have made a dancing show for young children . This show is full of music by Accordeon Melancolique. In the radio play Zeeuwsch Meisje transmitted in the programme met het oog op morgen contains compositions and performance by Jean-Pierre. The music in the Dutch Tv documentary de Koperen ploeg by Kristie Stevens concerning the Amsterdam Harbour is by Accordéon Mélancolique. Enjoy a tour of The National park at Ellis Island in New York, USA where immigrants were processed for entry into the US for many years. The tour is for Ellis Island and Liberty Island where the statue of Liberty is. There is no specific address as you have to take a boat to get there (there are two islands) and you can catch a boat from New York or New Jersey. 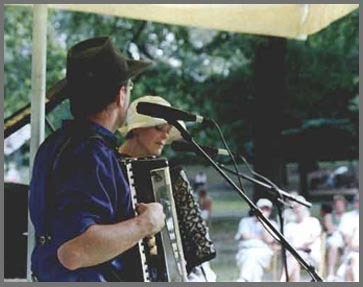 While listening to the tourist information on the MP3 player provided you can also enjoy fragments of music by Accordeon Melancolique. The Mp3 tour will be available till 2008. When you go to Paris, don't be surprised to hear Accordeon Melancolique playing on the information Channel in up to 50 Hotels. Music of the CDs has been used for the Humanitas DVD eigenwijs is onze wijs . In a edition of 4000 copies. How do you play beautiful music on a ugly instrument. For one hour we talked (in Dutch) about this item. We were guests in the program de Wandelende Tak VPRO RADIO NL. focused on worldmusic. Besides tracks of our CDs also live recordings were used. L'heure bleu. During this program broadcasted on the Dutch national radio thirteen tracks of our albums were given airplay. (inter-)national stages - with a concert for hundreds of listeners in Jyderup accordion festival in Denmark and twice on the international accordion festival in Iceland. Germany, Berlin, Hamburg, Magdenburg and Norway, Arendal. Concert during the famous Amsterdam Books gala. Amsterdam - Van Gogh Museum. Friday evening concert. Enschede - Concordia. During the tango festival Fiebre del Tango. Utrecht - concert in the Blue Room of the municipal theater.